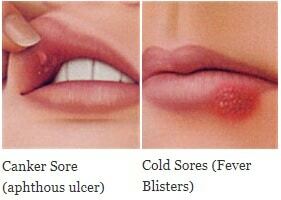 Canker sores, also known as aphthous ulcers, are non contagious, shallow ulcers that appear inside areas of the mouth. They are often accompanied by pain and can cause discomfort when chewing or talking. Canker sores look like small, yellow or white ulcers surrounded by red tissue that are typically found on the tongue, gums, or on the inside of lips. Oral sores are a common dental problem that typically heal within 1-2 weeks, but persistent sores that last longer than a couple of weeks may be the early stages of oral cancer. If you’re looking for experienced help in treating canker sores, give us a call today at Carson & Carson (805) 983-0717 or contact us online using the button below. Minor canker sores – Are small and typically heal in 1-2 weeks without treatment or scarring, can be accompanied by pain, and account for nearly 80% of all canker sores. Major canker sores – Are larger and can take up to 6 weeks to fully heal. This type of canker score can leave hefty scarring, can be excruciatingly painful, and are far less common. Herpetiform canker sores – Are super small in size, appear in patches with up to 100 sores, and heal in 1-2 weeks similarly to minor canker sores. Although these two types of canker soars are often confused, they are quite different. Unlike cold sores, canker sores only appear inside the mouth, are not contagious, and are not caused by the herpes virus. On the other hand, Cold sores , also known as fever blisters, appear outside areas of the lips or mouth and are highly contagious through touch. Minor injury to oral tissues from things like: brushing teeth to hard, biting your cheek, braces or dentures, dental work, or a sports injury. Foods that are high in acidity or spices can trigger or worsen a canker sore outbreak. Food allergies or sensitivities can cause a canker sore outbreak. Genetics. Canker sores may be hereditary or simply occur in people that live in the same environments, eat the same food, or have the same allergies. Improper balance of nutrition intake that is lacking vitamin B-12, iron, zinc, or folate which is folic acid. These particular nutrients help you prevent the occurrence of canker sores. Using dental hygiene products that contain sodium laurfyl sulfate has shown to increase the likelihood of developing canker sores. Presence of certain bacteria in the mouth can trigger an allergic response that can cause canker sores. Stress & smoking are both known to weaken your immune system response and can lead to an increased risk a canker sore outbreak. Hormonal fluctuations can cause canker sores, as seen in women who are menstruating or during puberty. Drugs including: Aspirin, NSAID’s, nicotine, certain antibiotics, immunosuppressants, antihypertensives, vasodilators, and protease inhibitors can cause canker sores. Diseases including: Celiac disease, Crohn’s disease, Behcet’s disease, and HIV/AIDS are all associated with a higher risk of canker sore outbreak. Canker sores can develop in any individual, but are more likely to occur and during the teen years and early adulthood. Canker sores are also more likely to develop in females than in males. Some individuals also experience a burning or tingling sensation in the area where a canker sore forms up to 24 hours before the sore appears. Individuals who have a canker sore outbreak that is accompanied by any of the less common symptoms should see a doctor to ensure there is not a more serious infection or issue. Brushing your teeth with care as to avoid aggravation of canker sores from contact with toothbrush bristles. Avoiding the use of toothpaste or mouthwash that has lauryl sulfate. Drinking cold fluids or dissolving ice in your mouth. The coldness can numb the canker sore and ease pain, but in some cases, the cold fluid touching the sore can cause sharp pain. Rinsing your mouth with a salt + water mix can help relieve pain from canker sores. Rinsing your mouth with a mixture of milk of magnesia and Benadryl can help with canker sores. Dabbing milk of magnesia directly on the sore with a cotton swap can also be effective. Over-the-counter pain relievers such as NSAID’s like asirin or ibuprofen. DO NOT take aspirin if you are under the age of 20 or are already bleeding. Applying topical medications directly to the canker sore such as benzocaine or lidocaine can help relieve the pain or discomfort. Avoid foods and actions that irritate the inside of your mouth or have triggered an outbreak in the past. This can include avoiding eating acidic or spicy foods, using a soft bristled toothbrush to avoid irritation while brushing, and avoiding habits such as smoking tobacco or drinking alcohol. Ensure that your diet has a proper balance of: B-12, iron, zinc, and folic acid. These nutrients provide support for your body that can help prevent future canker sores. Reduce your stress levels. Stress negatively impacts the function of your immune system, and avoiding or reducing it can help prevent canker sores from developing. Get high-quality dental care from the Oxnard dentist with over 45 years of experience at Carson & Carson, DDS today. Call us at (805) 983-0717 for more information or to speak to dental professional about our treatment options for canker sores. Find affordable dental services from an experienced dentist you can trust at Carson & Carson, DDS in Oxnard, California.